The NEXT STEP in back support evolution. Excellent for all activities. Extremely comfortable to wear. Allows full range of motion for the body and spine Helps tone and strengthen abdominal and back muscles Promotes proper posture. Won't ride-up, pinch or bind. The TWINFLEX unique spinal channel allows your spine to flex naturally without restriction or discomfort. While other designs utilize hard or restrictive materials that press on the spine or into the body, the TWINFLEX fully supports the lower back muscles through TWO independent pads. 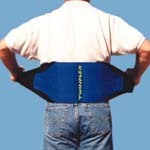 The twin pads give extra support to the muscles on each side of the spine allowing total mobility. Since most common back aches are caused by poor spinal motion due to weak and unconditioned back muscles, it only makes sense to target those muscles for rehabilitation and strengthening. The TWINFLEX back support allows you to stay active and use those muscles while supporting them with adjustable direct compression. The spinal channel allows both the abdominal and lower back muscles to work naturally while helping to promote correct spinal posture. You can exercise and maintain proper tone instead of experiencing any type of dependency or muscle atrophy while wearing this support. The TWINFLEX back support acts like a second skin, stretching equally in any direction and conforming to your own individual body shape. You can move freely in any position without it riding up, pinching or binding. What Is Moist Heat Therapy? 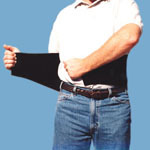 The TWINFLEX back support is made with a high-grade, closed-cell neoprene which allows the support to retain body heat, generating moist heat therapy. This moist heat therapy helps muscles stay warm and flexible, reducing the risk of injury while increasing circulation of oxygen and blood flow to your muscles helping to reduce pain and soreness. Many steps can be taken to reduce common back pain. The TWINFLEX's innovative approach to back care can be an integral part of keeping your back healthy and pain free while enjoying your favorite activities. Too often one suffering from low back pain is stuck with an ineffective or uncomfortable support. That won't happen with the TWINFLEX back support. Accept the risk-free TWINFLEX challenge. Wear our support for 30 days and experience for yourself its comfort and effectiveness. 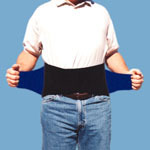 If you are not totally satisfied with your TWINFLEX back support, return it to your original place of purchase for your money back. N.F.L., N.B.A., N.H.L., P.G.A. Pro's & U.S. Ski team members. 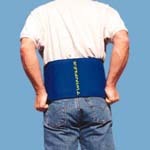 Endorsed by medical providers including: Chiropractors & Physical Therapists.